School is out and summer has begun. For eleven year old Timmy Quinn and his best friend Pete Marshall, the dreary town of Delaware Ohio becomes a place of magic, hidden treasure and discovery. 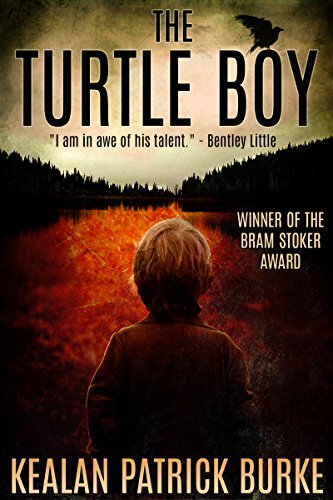 But on the day they encounter a strange young boy sitting on the bank of Myers Pond a pond playground rumor says may hide turtles the size of Buicks everything changes. For it soon becomes apparent that dark secrets abound in the little community, secrets which come cupped in the hands of the dead, and in a heartbeat, Timmy and Petes summer of wonder becomes a season of terror, betrayal and murder. This was such a strange little story that I’m almost unsure how I feel about it. It has a lot of supernatural mixed in with a little bit of crime, and a lot of areas I feel quite oddly about. Firstly, it was a very short tale. There was a lot of room left for plot-building, tension, character development, and setting. I needed more on the history of the town, more on the supernatural element and why it ended up where it did, and a bit of elaboration on the two families we met. Our protagonist Timmy, although lacking somewhat in backstory, was a great kid. Burke has written him perfectly to allow us to support him and become engaged in what happens to him. It’s the character of Timmy alone which makes me want to continue with the series; I want him to be okay. The pace was great, despite my need for further detail, and we came to the crunch pretty quickly. Burke’s narrative is compelling, making it impossible to stop reading. I felt completely watched and unsettled when reading the creepier sections of the story, and it’s been a while since an author has made me feel that way when writing of the paranormal. When the story picks up, it really becomes a race to inhale all of Burke’s words at once; to find out as much as possible. Burke’s ending had a strong unresolved feeling, I assume in order to make way for the sequel. Although it’s not difficult to work out the over-arching twist, it just didn’t work. My main frustration was a hint to supernatural elements which absolutely should have been explored in more detail here to give us a better understanding of what we were dealing with. I’m torn with this; I enjoyed it to an extent, but I’ve come away with an utterly flat feeling, as though I’ve missed out on something. I may delve into the next in series to see if I feel differently, but I’m not in any rush to do so.